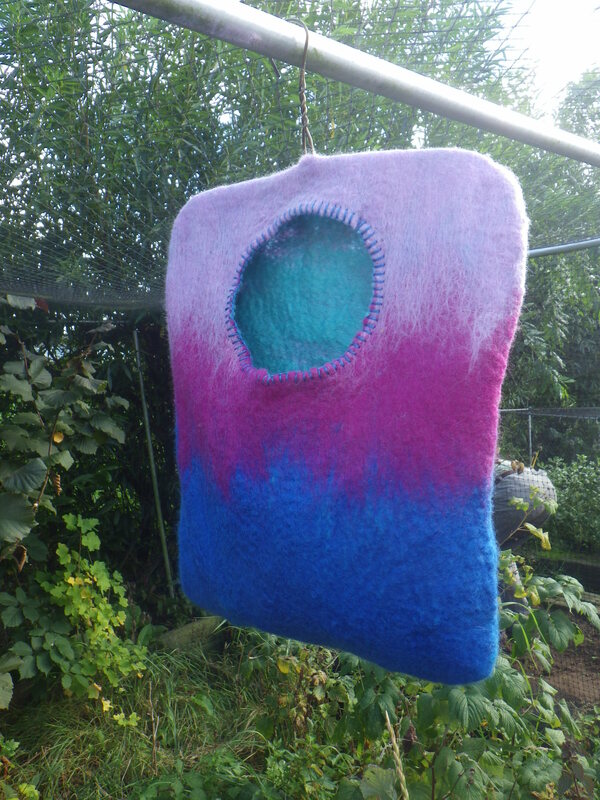 Ages and ages ago I bought a felting kit for a peg bag. 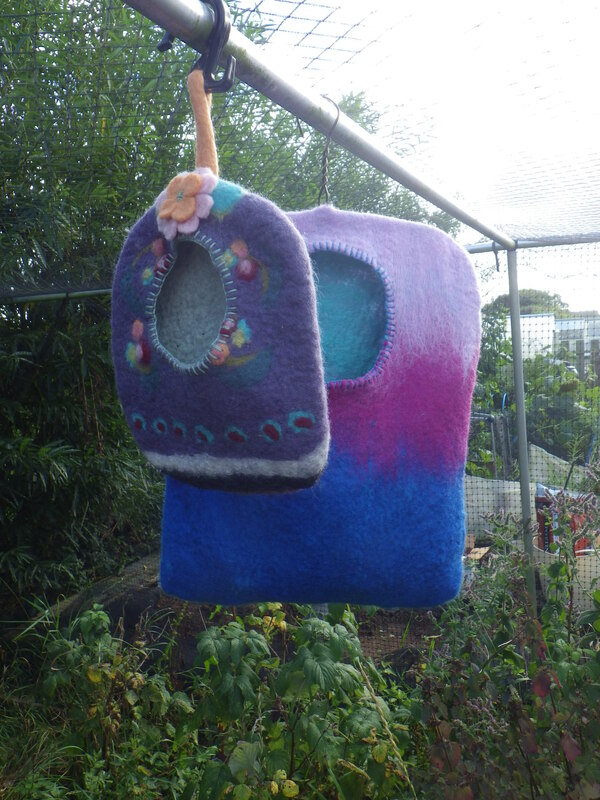 It seemed like a great idea and having a kit would give me a chance to practice my (then) recently acquired felting skills but with a safety net, so the speak. 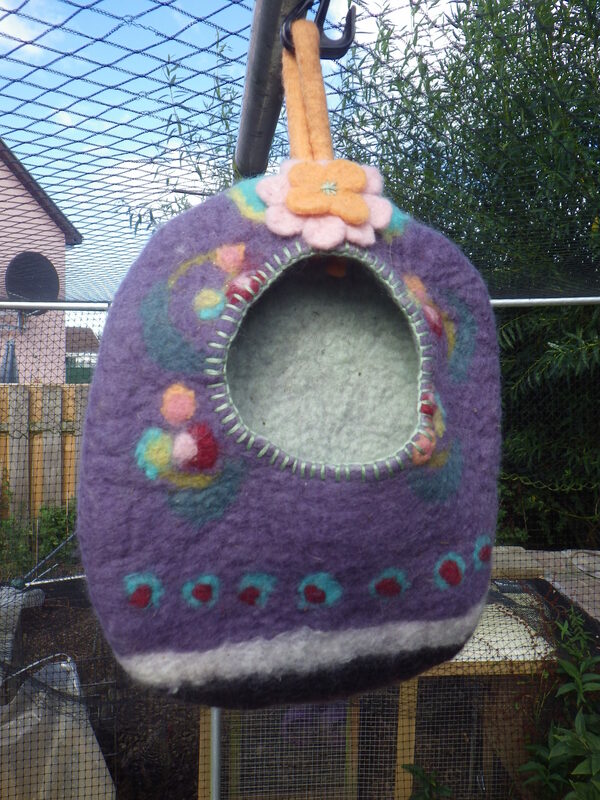 I made it up following the instructions and produced a lovely, fancy little felted bag… much more beautiful than I would have designed if left to my own devices. The problem was that the main way to describe it was ‘little’: it held about 12 pegs. I simply couldn’t fit all my pegs into it and so, however beautiful, it really wasn’t much use. Since I completed it, it has been sitting on top of the washing machine, unused. Last week, I decided that the time had come to make a more functional peg bag – one that would hold all my pegs and that would be good for years of use. I didn’t want to spend a huge amount of time on it, so I chose a single colour for the interior and three for the exterior, with no embellishments. All but the purple wool, which is Merino, is British Blue-faced Leicester. I used a wire coat hanger for the hook and to help it to hold its shape inside and edged the hole with embroidery silk that I’ve had for about 35 years! It’s a bit more square than I would have liked – the pod-shape of the original appeals to me – but I’m quite pleased with it. I may have gone to the other extreme in terms of size and it’s certainly not as fancy as the first one, but I’m really pleased with it and, other than the stitching, it only took a couple of hours to make. The tiny original, I’m going to hang up in my office and use if to keep little USB cables in because I’m always putting them down and forgetting where… I knew it wouldn’t go to waste. Love the peg bags both of them- I have an ice cream tub! We used to have a cotton bag that a sheet came in, but it was wearing rather thin!